All three choices have their pros and cons, with the first option being preferred by consumers who are not tech-savvy to begin with. In that case, the customer usually pays a monthly rental fee to the ISP. The maintenance of the gateway (including firmware updates) is handled by the ISP too. ISP-handled firmware updates, preventing patching of router firmware for vulnerabilities / preventing users from taking advantage of new Wi-Fi router features developed by the vendor for their wireless routers product-line. 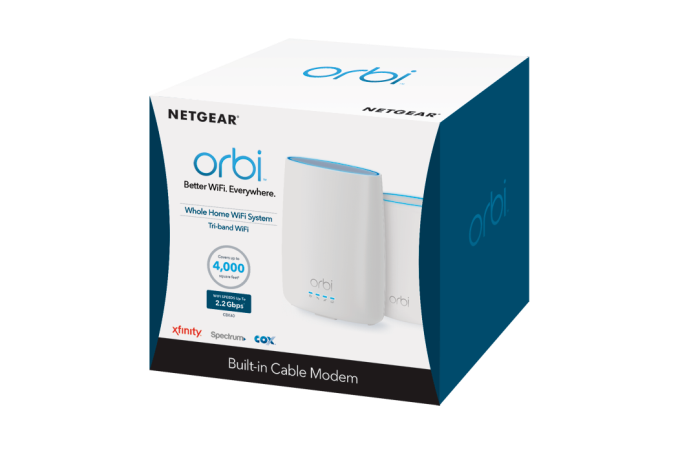 Today, Netgear is launching the Orbi cable modem - a dual PCB solution with the same form-factor as that of the existing Orbi RBK40 kit. The dual PCB solution refers to the cable modem and the wireless routers coming on distinct boards, with separate firmware for each. ISPs can handle the firmware update for the modem segment, while the consumers can update the wireless router firmware independently. The activation process has also been simplified by Netgear, with new features in the Orbi mobile app making it a seamless process. Netgear has been very active in releasing new firmware features for their Orbi products (tying in with their pivot to a services-based revenue model for their offerings). Features such as 'Circle with Disney' (which has a premium subscription option) are turning out to be hits based on the feedback we have received from current Orbi customers. The ability to update the Orbi router firmware independent of the cable modem firmware is a key feature of the Cable Orbi. The modem / router device can act as the master in a mesh Wi-Fi system. Combining the modem and router into one device implies fewer devices to purchase for the consumer. Netgear has two SKUs with the Cable Orbi hardware - the Cable Orbi Router (CBR40), priced at $300, is a single device that integrates the modem and wireless router into one unit. The Cable Orbi Kit (CBK40) bundles a satellite with the Cable Orbi Router for $400. 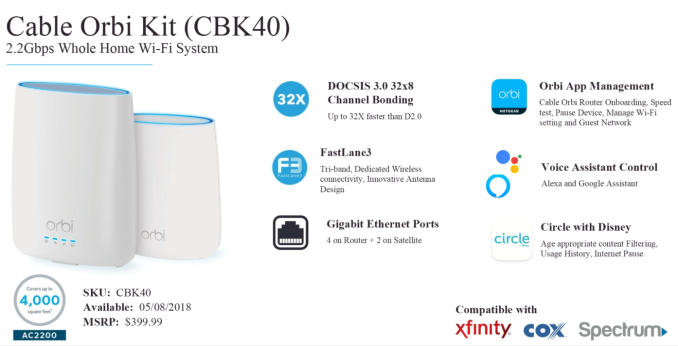 Coming to the technical specifications, the CBR40's wireless components are derived from the AC2200 Orbi RBK40 introduced last year - a Qualcomm Atheros IPQ4019 network processor with Wi-Fi SON features, and separate 2x2 radios for the client devices and the backhaul. The cable modem PCB is based on the Intel Puma chipset (we have reached out to Netgear to confirm that it is not the one affected by the network latency issue. [Update: Netgear informed us that the CBR40 has all the patches they received from Intel to address the Puma 6 issues.]). It is a DOCSIS 3.0-compliant modem with a 32x8 channel bonding configuration supporting a maximum of 1.4 Gbps downstream and 262 Mbps upstream bandwidth. Netgear is obviously building on the success of the Orbi lineup with the integration of a cable modem into the lineup. This definitely increases the addressable market for Orbi products within the home networking space. Consumers using ISP-supplied gateways to blanket large areas with Wi-Fi would do little wrong in opting for the CBR40 or CBK40. Power users and tech-savvy consumers might prefer a more flexible solution with a discrete modem, router, switches, and access points. The Cable Orbi is not meant for those folks. For the average consumer, the Orbi lineup now has SKUs that can cater to varying requirements and budgets. You'd be crazy to get a cable modem with a Puma chipset. The problems are silicon level and Intel's firmware hacks aren't going to fix the root throughput issues, but they have negated much of the problem for CASUAL users. Good luck torrenting on a Puma 6 long term without abysmal performance or it outright crashing every few days. If you need a top notch modem, the Arris SB8200 or the Netgear CM1000 are both DOCSIS 3.1, and a theoretical 10Gbps (realistic is 6Gbps) so you'd be futureproof for the next decade on any BCM3390 chipset modem. They're both about $100. No way VM would move to a 32x8 DOCSIS 3.0 system now, it's a sidegrade from the Superhub3.0. ARRIS was literally sued last year because of this steaming pile of junk: it's that bad. You should read the article first before commenting. The cable modem PCB is based on the Intel Puma chipset (we have reached out to Netgear to confirm that it is not the one affected by the network latency issue).